On my most recent visit to Paris, I traveled with my equally shopaholic friend, Krista. Like any good shopper, she loves a good bargain. We often compare notes on deals we find. The area where my friend far outshines me though is her expertise in thrifting second hand stores. 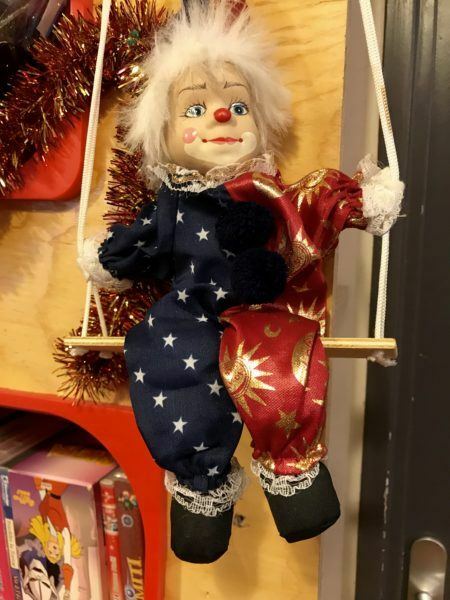 She had done her research and scouted out a Paris thrift store not too far from our Airbnb–Emmaus boutique in the north Marais at 74 Rue de Turbigo. Paris Thrift and Second Hand Stores versus Paris Vintage Stores versus Paris Consignment Stores– what’s the Difference? While Paris vintage stores often were listed as Paris “thrift stores” in Krista’s online research, she explains that they are not the same. While Paris is filled with vintage stores in every price range, thrift stores are far more rare. As she explained, a vintage store is almost always clothing and accessories only (no housewares or knickknacks which thrift stores always carry). The proprietor of the vintage store finds clothing that is usually a couple decades or so old at least and selects it specifically to be sold in the store. In a thrift store (also often called second hand stores), donated goods supports a charity or multiple charities – expect far cheaper prices than a vintage store. In our area, the predominant thrift stores are run by Goodwill, so we often use “thrift” and “Goodwill” interchangeably. Also, thrift stores carry housewares, which are Krista’s favorite items to rifle through. You just never know what you might find. 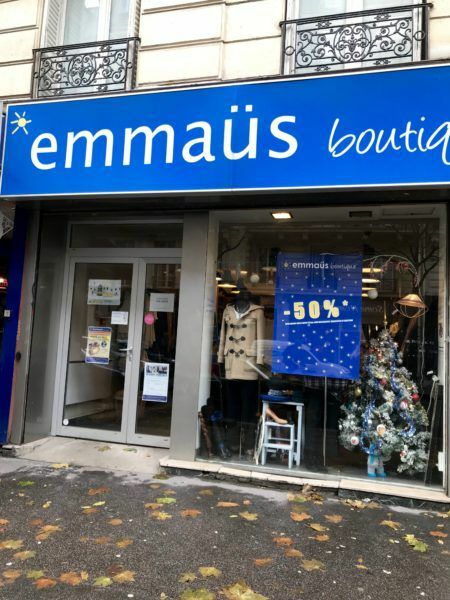 Emmaus Boutique in Paris– a French thrift store, similar to what we in the US know as Goodwill or a second hand store. Consignment stores are distinct from both vintage and thrift stores in that consignment stores are for profit and people resell their stuff – which will vary in terms of bargains – the clothes here are usually contemporary. Finally there are some stores that do a combo of donations and consignment – these also support a charitable cause. Prices are more expensive than thrift, but still reasonable. We didn’t see anything like this in Paris. For the rest of us, thrifting second hand stores can be a unique way to see a slice of Paris life you wouldn’t otherwise see (I found it fascinating to see what random items Parisians donated). And of course there is the absolute thrill of the hunt and possibly finding a huge bargain, and bringing home a souvenir. I was pleasantly surprised at the Parisian thrift store experience. I haven’t spent much time at Goodwill in the US, but my limited experiences with second hand stores have been meh to awful. And depending on the store, vintage shop owners can sometimes be somewhat snooty. At Emmaus, though, the staff was lovely and very helpful. Significantly, when I spoke French no one replied to me in English (a practice I find downright rude). Krista found the Paris thrift store Emmaus to be much smaller than Goodwill and other second hand stores in the US, but similar presentation to a lot of places. 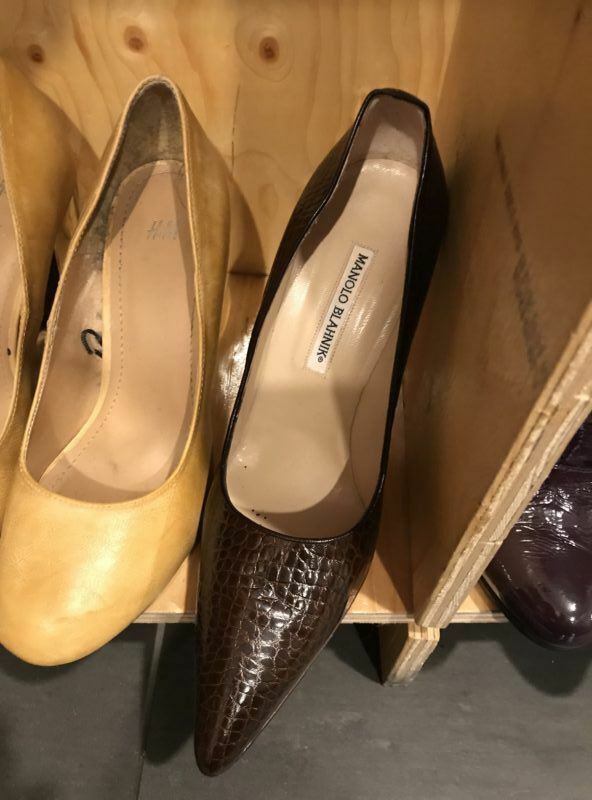 While she didn’t get a chance to check out the clothes, they looked a little nicer than your average Goodwill (I did check out the clothes can and confirm they were way nicer– see Manolo Blahnik shoes below). She enjoyed the packed knick knack section and wishes she had more time to look through it (we were in a rush with a full day planned). On the day we visited, all the clothing was half price. I wasn’t in the mood to try things on but did see a few second hand options I would consider. These Manolo Blahniks were about 80 euro and half price the day I visited. 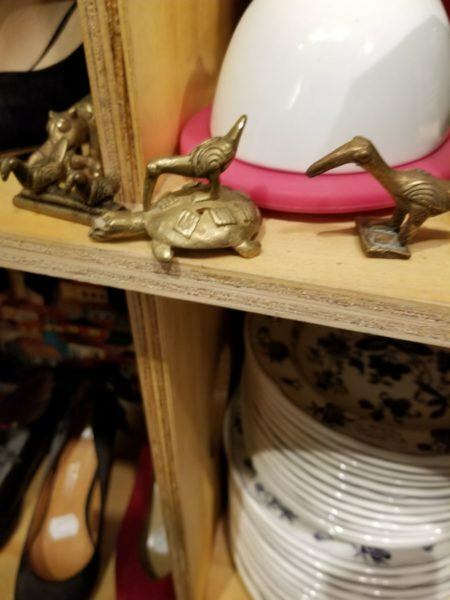 Krista eyed these brass figurines and sorely regrets not buying them. With all thrift stores, buy it when you see it or it will be gone. The thrift store hours were pretty decent, open daily except Sunday 11:00 am-7:30 pm (unlike the flea market which was only open two days a week and seemed overwhelming). If you don’t thrift, visiting a second hand store is probably not what you want to do on a vacation, but if you do, definitely stop in. Have you been thrifting in Paris? 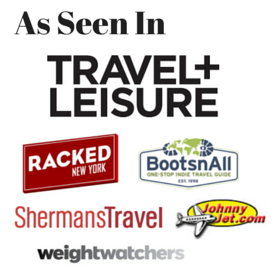 If so, please share your experiences and tell us about your favorite stores! The Paris thrift stores are definitely worth a stop on my next trip. Great post Kristin. Hi, Kristin (and Krista, too)–Happy Belated New Year! The answer to the question posed in this post is No, I have not shopped in any of the stores described in the blog. The first and only times I’ve ever bought something in Paris was way back in late July of ’74 on my first trip abroad. I shopped for souvenirs at Printemps Department Store: a small metal model of the Eiffel Tower for me and an Eau de Cologne in a plastic model of the Eiffel Tower for my sister. My next visit to the “City of Lights” was in fall of ’95 as a shore excursion from a cruise ship that called at Le Havre. There was barely enough time to tour the city: a Bateaux Mouche river cruise w/a boxed lunch plus a short sightseeing bus trip that showed us Le Invalides (Napoleon Bonaparte’s tomb), the cemetery where Jim Morrison was buried, and other touristy spots. Then we went back to the train station for the return trip to the ship (we came to the city that way, too). Ditto w/the first trip to Paris in ’74: a boat train: train from London, a ferry ride across the Channel, and a train to Paris where our group stayed for a week in a small hotel-I forget the name. I LOVE thrifting in the US, and I don’t know why I haven’t thought about doing it in Europe! 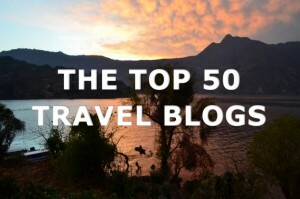 New #travelgoals! I know I couldn’t believe I hadn’t either! My friend who researched them said it was tricky to distinguish a vintage store from an actual thrift store when googling or looking at yelp because they were often lumped together. Emmaus is a great organization to combat poverty and homelessness. A good charity! I can’t believe I didn’t even mention the obvious haha! Yes total bonus to get a bargain and support a worthy cause! I’m so glad we found it. Great post! Will definitely have to check Emmaus out. “Significantly, when I spoke French no one replied to me in English (a practice I find downright rude).” THIS. I’ve lived in France for nearly two years, and I find it demeaning when people switch to English when I speak to them in French. I get it, I have an accent, but that is not an invitation to speak English with me. Haha I hear you!! I was once fluent and even though my vocabulary is weak after so many years, I know my accent is pretty good and they understand me, so all the more aggravating!